Berkley Lab researchers show how beams of various colors and phases affect plasma, finding that laser light needn’t be as precise as previously thought to drive miniature particle accelerators. Making a tabletop particle accelerator just got easier. A new study shows that certain requirements for the lasers used in an emerging type of small-area particle accelerator can be significantly relaxed. Researchers hope the finding could bring about a new era of accelerators that would need just a few meters to bring particles to great speeds, rather than the many kilometers required of traditional accelerators. The research, from scientists at the U.S. Department of Energy’s (DOE) Lawrence Berkeley National Laboratory (Berkeley Lab), is presented as the cover story in the May special issue of Physics of Plasmas. Traditional accelerators, like the Large Hadron Collider where the Higgs boson was recently discovered, rely on high-power radio-frequency waves to energize electrons. The new type of accelerator, known as a laser-plasma accelerator, uses pulses of laser light that blast through a soup of charged particles known as a plasma; the resulting plasma motion, which resemble waves in water, accelerates electrons riding atop the waves to high speeds. The problem, however, is creating a laser pulse that’s powerful enough to compete with the big accelerators. In particular, lasers need to have the capability to fire a high-energy pulse thousands of times a second. Today’s lasers can only manage one pulse per second at the needed energy levels. “If you want to make a device that’s of use for particle physics, of use for medical applications, of use for light source applications, you need repetition rate,” explains Wim Leemans, physicist at Berkeley Lab. In January of 2013, the DOE held a workshop on laser technology for accelerators. At the time, says Leemans, the big question was how to get from the current technology to the scaled up version. But the new Berkeley Lab study has found this isn’t the case. 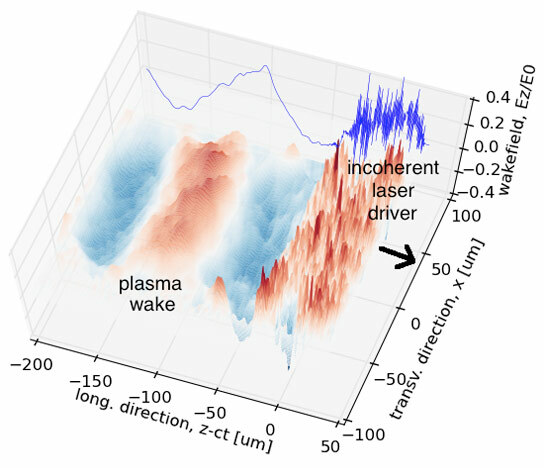 Paper co-authors Carlo Benedetti, Carl Schroeder, Eric Esarey and Leemans wanted to see what an erratic laser pulse would actually do inside a plasma. Guided by theory and using computer simulations to test various scenarios, the researchers looked at how beams of various colors and phases—basically a hodgepodge of laser light—affected the plasma. They soon discovered, no matter the beam, the plasma didn’t care. “The plasma is a medium that responds to a laser, but it doesn’t respond immediately,” says Benedetti, a physicist at Berkeley Lab. The light is just operating on a faster time scale and a smaller length scale, he explains. All of the various interference patterns and various electromagnetic fields average out in the slow-responding plasma medium. In other words, once laser light gets inside the plasma, many of the problems disappear. Leemans says the ball is back in the experimentalists’ and laser builders’ court to prove that the idea can work. In 2006, he and his team demonstrated a three-centimeter long plasma accelerator. Where a traditional accelerator can take kilometers to drive an electron to 50 giga-electron volts (GeV), Leemans and team showed that a mini-laser plasma accelerator could get electrons to 1 GeV in just three centimeters with a laser pulse of about 40 terawatt. To go to higher electron energies, in 2012, a larger more powerful laser was installed at the Berkeley Lab Laser Accelerator (BELLA) facility with a petawatt pulse (1 quadrillion watts) that lasts 40 femtoseconds, which is now being used in experiments that aim at generating a 10 GeV beam. This work was supported by the DOE Office of Science and used the facilities of the National Energy Research Scientific Computing Center (NERSC) located at Berkeley Lab. Be the first to comment on "A Path Toward a New Breed of Miniature Particle Accelerators"